Please find attached the followup report and weblinks and videos for the recent meeting on partnerships for sustainable energy, which was held in conjunction with the recent UN Summit. EUCC was a registered participant in this event. News and other relevant materials, including film clips used during the event, can be found on www.se4all.org. Upcoming free webinar on how to scale up renewable energy deployment in island regions. The webinar, organized jointly by IRENA and Leonardo Energy, will share insights from the recent training workshop held in Fiji for the Pacific Islands. Background: Due to their limited land area and remote and dispersed geographical location, many Small Island Developing States are facing compounded challenges in delivering reliable, sustainable and affordable energy services. Various sources have quoted the extreme petroleum dependency with indicative figures as high as over 95% of commercial energy consumption being sourced from imported petroleum in the Pacific Islands. Electricity consumption accounts for about a quarter of imported petroleum in the Pacific, mostly in the form of diesel and heavy fuel oil (HFO). Many islands have announced their commitment to accelerate the transition to renewable energy in the form of renewable energy targets. Adopting binding, credible targets with clear accountability structure provides the foundation for the basic tenets of sound policy design, namely: transparency, longevity and certainty. However, fulfilling the targets carries a host of challenges. This webinar will address common questions that policy makers often face when scaling up renewable energy deployment in Small Island Developing States. New tool monitors effects of tidal, wave energy on marine habitat Researchers building a new underwater robot they’ve dubbed the “Millennium Falcon” certainly have reason to believe it will live up to its name. The robot will deploy instruments to gather information in unprecedented detail about how marine life interacts with underwater equipment used to harvest wave and tidal energy. Researchers still don’t fully understand how animals and fish will be affected by ocean energy equipment, and this instrument seeks to identify risks that could come into play in a long-term marine renewable energy project. “This is the first attempt at a ‘plug-and-socket’ instrumentation package in the marine energy field. If successful, it will change the way that industry views the viability of environmental research and development,” said Brian Polagye, a University of Washington assistant professor of mechanical engineering and one of the project’s leaders. The UW research team tested the Millennium Falcon and the instruments it transports, called the Adaptable Monitoring Package, underwater for the first time in January in a deep tank on campus. Researchers will continue testing in Puget Sound under more challenging conditions starting this month. They hope this tool will be useful for pilot tidal- and wave-energy projects and eventually in large-scale, commercial renewable-energy projects.“We’ve really become leaders in this space, leveraging UW expertise with cabled instrumentation packages like those developed for the Ocean Observatories Initiative. What’s novel here is the serviceability of the system and our ability to rapidly deploy and recover the instruments at low cost,” said Andrew Stewart, an ocean engineer at the UW Applied Physics Laboratory. The instrument package can track and measure a number of sights and sounds underwater. It has a stereo camera to collect photos and video, a sonar system, hydrophones to hear marine mammal activity, sensors to gauge water quality and speed, a click detector to listen for whales, dolphins and porpoises, and even a device to detect fish tags. A fiber optic cable connection back to shore allows for real-time monitoring and control, and the device will be powered by a copper wire.The breadth of sensors and various conditions this instrument can measure is unprecedented, researchers say. The tool also is unique for its ability to attach to most types of underwater infrastructure, ranging from tidal turbines to offshore oil and gas rigs. This allows researchers to easily deploy the instrument far offshore and recover it quickly at a relatively low cost compared with other approaches. “It could be a first step toward a standardized ‘science port’ for marine energy projects,” Polagye said. This speedy deployment and recovery — sometimes in rough seas — is possible because the instrument fits inside a remotely operated vehicle, or ROV, that can maneuver underwater and drop off the instrumentation package at a docking station integrated onto a turbine or other existing subsea infrastructure. The vehicle is about the size of a golf cart, and the research team outfitted the off-the-shelf Falcon underwater surveying machine with five extra thrusters on an external frame to give it more power to move against strong currents. Actuators on the vehicle latch the monitoring instruments onto a subsea docking station, and then the Millennium Falcon can disengage, leaving the instruments in place, and travel back to the water’s surface. This project is a collaboration between researchers in mechanical engineering and the Applied Physics Laboratory, within the larger Northwest National Marine Renewable Energy Center, which is a multi-institution organization that develops marine renewable energy technologies through research, education and outreach. The center and the Applied Physics Laboratory recently received $8 million from the U.S. Navy to develop marine renewable energy for use at its facilities worldwide. Development of this environmental monitoring instrument was prompted by a long-running tidal energy pilot project with the Snohomish County Public Utility District in Admiralty Inlet that recently was dropped because of ballooning costs. Going forward, researchers expect to use the same device to monitor marine-energy projects cropping up around the world and help to reduce the cost of future developments. “Snohomish PUD was really at the forefront of projects grappling with this problem of monitoring a tidal turbine in deep, fast moving water. But as other projects in the U.S., Europe and Canada have faced similar monitoring scenarios, the instrumentation package is shaping up as a strong candidate to meet their needs,” Polagye said. Other lead researchers are UW mechanical engineering graduate students James Joslin and Emma Cotter. The project is funded by the U.S. Department of Energy, the U.S. Naval Facilities Engineering Command, the Snohomish County Public Utility District and the UW. 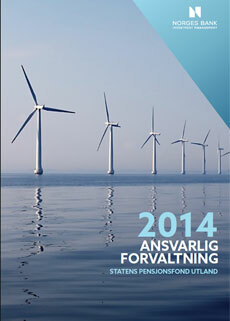 Norway’s Government Pension Fund Global (GPFG), worth $850bn (£556bn) and world’s biggest sovereign wealth fund was founded on the nation’s oil and gas wealth. It revealed a total of 114 companies had been dumped on environmental and climate grounds in its first report on responsible investing, released on Thursday. The companies divested include tar sands producers, cement makers and gold miners. She said GPFG had divested from 22 companies because of their high carbon emissions: 14 coal miners, five tar sand producers, two cement companies and one coal-based electricity generator. In addition, 16 coal miners linked to deforestation in Indonesia and India were dumped, as were two US coal companies involved in mountain-top removal.